Sodium Bicarbonate, Citric Acid, Theobroma Cacao (Cocoa) Seed Butter, Zea Mays (Corn) Starch, Sodium Lauryl Sulfate, Butyrospermum Parkii (Shea) Fruit Butter, Parfum (Fragrance), Rosa Centifolia (Rose) Flower, Coriandrum Sativum (Coriander) Leaf, Prunus Amygdalus Dulcis (Sweet Almond) Oil, Vetiveria Zizanoides (Vetiver) Root Oil, Citral, Hexyl Cinnamal, Hydroxycitronellol, Limonene, Linalool. Creamy with a really good kick to it. Looks really nice, smells amazing. 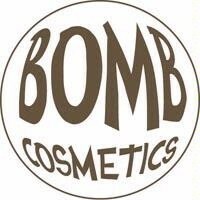 A really lovely bomb that smells so delightful, has a creamy base with a really good kick to it. 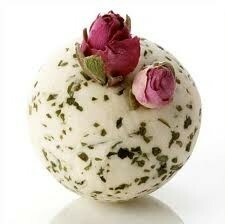 I like how the bomb looks and it fizzes away leaving leaves floating in the bath, giving off a gorgeous scent. The water is creamy and oily, moisturising the skin really well. Just make sure you clean out the bath after though.